For downtown Tampa’s Park Tower, a flurry of leasing activity unfolded before multimillion-dollar renovations began. The oldest office tower in downtown Tampa saw a flurry of leasing activity in 2017 — a year in which the rest of the downtown office market was largely at a standstill. But through a series of deals totaling 44,000 square feet, including the relocation of CapTrust Advisors from another Feldman-owned property, the tower’s occupancy is 87 percent. If all of the potential deals the landlord is chasing come to fruition, occupancy could top 90 percent by this summer, said Mike DiBlasi, vice president of leasing and marketing for Feldman. 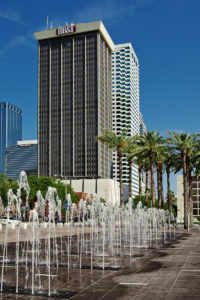 The success of Park Tower is significant for the overall downtown office market. The oldest office tower in downtown Tampa saw a flurry of leasing activity in 2017 – a year in which the rest of the downtown office market was largely at a standstill. Park Tower’s 22nd floor is getting two more new tenants. Dechert LLP and Bard, Rao + Athanas Consulting Engineers, LLC are the newest tenants to occupy the move-in ready spec suites which have been quickly absorbed by the market. “We hope to convert another floor to move-in ready suites this year — unless of course, a full floor user sweeps in first,” said Mike DiBlasi, Feldman Equities Executive Vice President for Leasing and Marketing. The deals were brokered by Brad Knop of JLL and Megan Lawler of Colliers International. Tampa’s beloved specialty coffee roaster, Buddy Brew Coffee with the passion to Brew Good and Do Good, announced today that they will open a new coffee shop location in downtown Tampa’s Park Tower. “We are excited to be opening a location in the heart of downtown Tampa and thrilled to be part of the beautiful renovation plan for Park Tower. We are delighted about City Office REIT and Feldman Equities’ plan to make the building come alive by creating a beautiful space for building community and connection in our urban center. These plans perfectly align with our Buddy Brew mission – to share joy and inspire hope that transforms our community. The new Park Tower will do exactly that. As a home-grown Tampa brand, we are overjoyed by this opportunity to share this mission with our downtown Tampa community. We love everything about this location and partnership,” said co-owner and CEO of Buddy Brew Coffee, Dave Ward. “Buddy Brew is an integral part of Park Tower’s multi-million dollar renovation as we focus on providing tenants with a top notch amenity package,” commented co-owner Larry Feldman, CEO of Feldman Equities. This new Buddy Brew Coffee cafe will boast a unique layout and design created by Tampa’s own premier architectural firm, Alfonso Architects. The design will feature a cosmopolitan aesthetic and high-end furnishings to match Park Tower’s modernization. Buddy Brew plans to offer their full menu of coffee drinks, eclectic culinary dishes and select pastries as well as craft beer and wine. Buddy Brew Coffee’s newest expansion will allow the company to bring their quality specialty coffee and Brew Good Do Good service to downtown Tampa. With the addition of the company’s sixth location, Buddy Brew Coffee is making strides to build brand awareness throughout the Tampa Bay area and beyond. 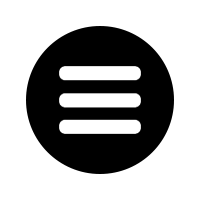 Buddy Brew Coffee, specialty coffee craft roaster, was founded by Dave and Susan Ward in 2010 with their first roaster and coffee bar in the heart of Tampa, Florida. Since then, they have rapidly expanded with four additional locations: a Coffee Bar at Oxford Exchange, Buddy Brew in Sarasota, Buddy Brew Hyde Park Village and Buddy Brew Coffee in Terminal F of the Tampa International Airport. 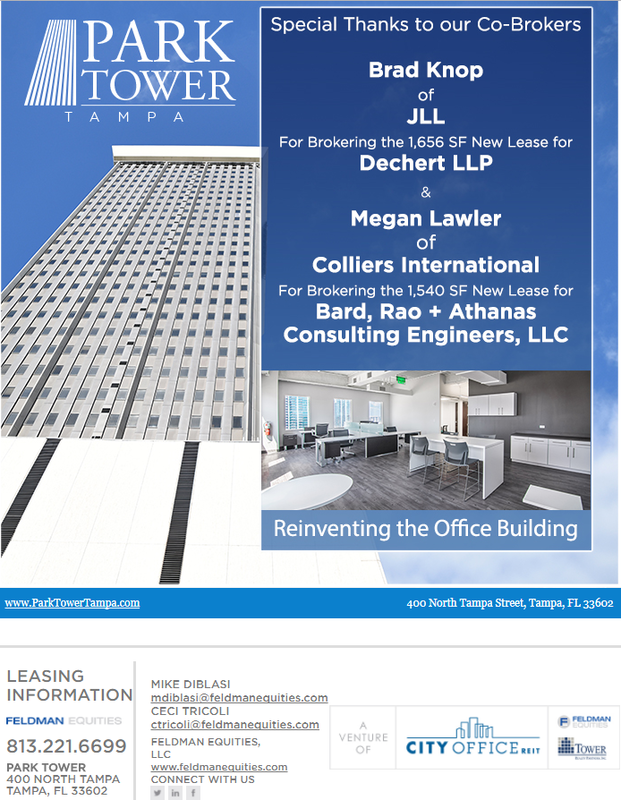 In November 2016, a joint venture partnership consisting of City Office REIT, Feldman Equities LLC and Tower Realty Partners acquired Park Tower, a 36-story, 475,000 square foot office building located in downtown Tampa. They have since embarked on an extensive multi-million dollar renovation. 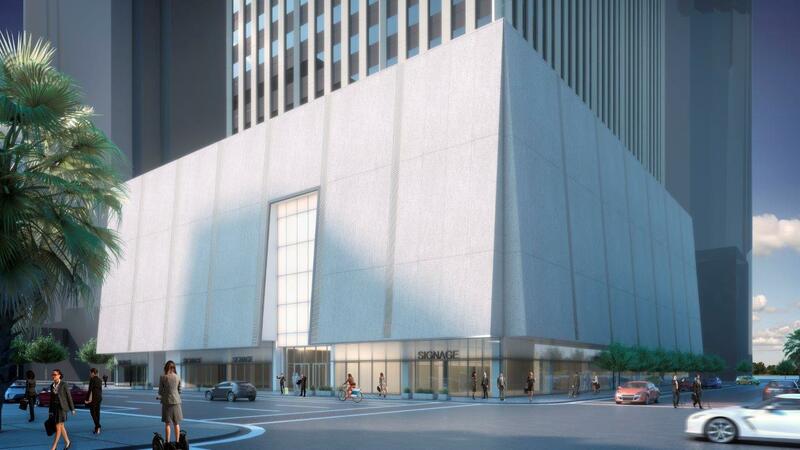 The most dramatic change at Park Tower will be the modernization of the building’s façade which includes painting the exterior a lighter color and a new and dramatic entrance. The building’s amenities will be also upgraded, including a striking new lobby featuring Buddy Brew Coffee. 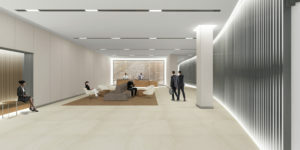 The office tower’s updated design by internationally-renowned architect Gensler will create a Class-A experience that persists from the sidewalk to the tenant door. 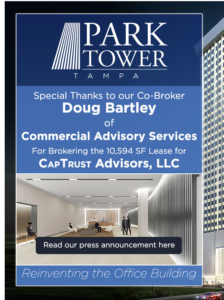 CAPTRUST Advisors, LLC has signed a lease to relocate its headquarters to nearly 10,500 square feet in Park Tower in downtown Tampa. The investment consulting firm will relocate to Park Tower later this year after almost 20 years in the CAPTRUST building at 102 W Whiting Street. That building is scheduled for demolition as part of Feldman’s Riverwalk development. The deal comes on the heels of the previously announced multimillion-dollar renovation to Park Tower. “The renovation plan is already impacting the building’s leasing,” said Mike DiBlasi, Feldman Equities Executive Vice President for Leasing and Marketing. “The plan to reposition this historic structure as one of the most notable and exciting buildings on Tampa’s skyline is resonating with prospects. We are seeing interest from quality conscious firms for whom high-end finishes and amenities are a must.” CAPTRUST will occupy the building’s 18th floor which features expansive views of the waterfront and downtown skyline. The tenant representation broker for the CAPTRUST lease transaction was Doug Bartley, Partner with Commercial Advisory Services. CAPTRUST Advisors, LLC is a privately-held, employee-owned, independent investment consulting practice headquartered in Tampa, Florida. Founded in 1998, CAPTRUST provides investment consulting services to institutional investors, corporate retirement plans, and family offices. The most dramatic change at Park Tower will be the modernization of the 475,000 square foot office building’s façade which includes painting the exterior a lighter color and a new and dramatic entrance. The building’s amenities will be also upgraded with a striking new lobby. In November 2016, a joint venture partnership consisting of City Office REIT, Feldman Equities and Tower Realty Partners acquired Park Tower for $79.75 million. 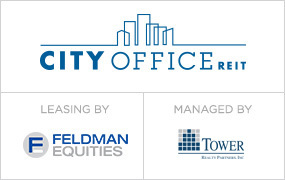 In conjunction with City Office REIT, Inc. (NYSE: CIO) (“City Office” or the “Company”) Feldman Equities and Tower Realty Partners have commenced an extensive multi-million renovation on downtown Tampa, Florida’s Park Tower. In November 2016, a joint venture partnership consisting of City Office, Feldman Equities LLC and Tower Realty Partners acquired Park Tower for $79.75 million. These groups have partnered together and previously renovated other notable office buildings in the downtown St. Petersburg, Florida market. The most dramatic change at Park Tower will be the modernization of the 475,000 square foot office building’s façade which includes painting the exterior a lighter color and a new and dramatic entrance. The building’s amenities will be also upgraded with a striking new lobby. “The renovation of Park Tower will use glass and light to reposition this prominent historic structure as one of the most notable and exciting buildings on Tampa’s skyline,” stated James Farrar, Chief Executive Officer of City Office. Internationally-renowned architect Gensler is the designer for both the exterior façade and the building amenities. The updated design extends a brand to Park Tower that will create a Class-A experience that persists from the sidewalk to the tenant door. “The opportunity to renovate our city’s original high rise is a real honor, and we’re excited to reposition Park Tower as one of the premium assets in the downtown core,” stated Bert Oliva, Principal and Managing Director of Gensler’s Tampa office. Mike DiBlasi, Feldman Equities Executive Vice President for Leasing and Marketing, expects the renovations and spectacular views of Hillsborough Bay, the Hillsborough River and the Downtown Tampa skyline to assist with the quick lease-up of the building’s remaining office space. “We have had tremendous success at leasing up our past projects after completing our renovation plans, and we expect that Park Tower will be similarly successful. Park Tower currently has full floor availabilities, including a full floor of just-built, move-in ready spec suites. This is a great opportunity for tenants of all sizes to move into the heart of downtown,” said DiBlasi. There are lots of exciting plans in the works for Park Tower! These two tenants who have chosen to renew and/or expand their leases will be around to reap the benefits. We appreciate their vote of confidence in choosing Park Tower yet again. Feldman Equities extends a special thank you to the cobrokers who negotiated the lease deals on their behalf. Need a full floor or a smaller move-in ready office space in downtown Tampa? Many of Park Tower’s availabilities have amazing water and city views! We’re building out seven move-in ready spec suites on the 22nd floor of Park Tower in downtown Tampa. This great office space will be ready for move in this summer. In the meantime take a 3D video tour! 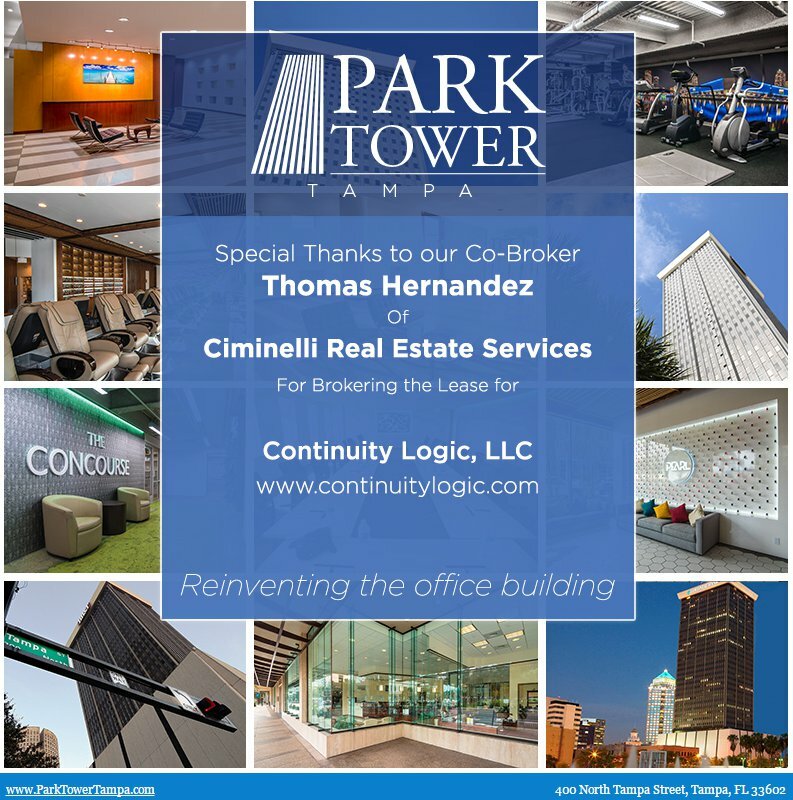 Continuity Logic will open an office in downtown Tampa having leased 3,384 square feet at Park Tower. Special thanks to our co-broker Thomas Hernandez of Ciminelli Real Estate Services for brokering the transaction. 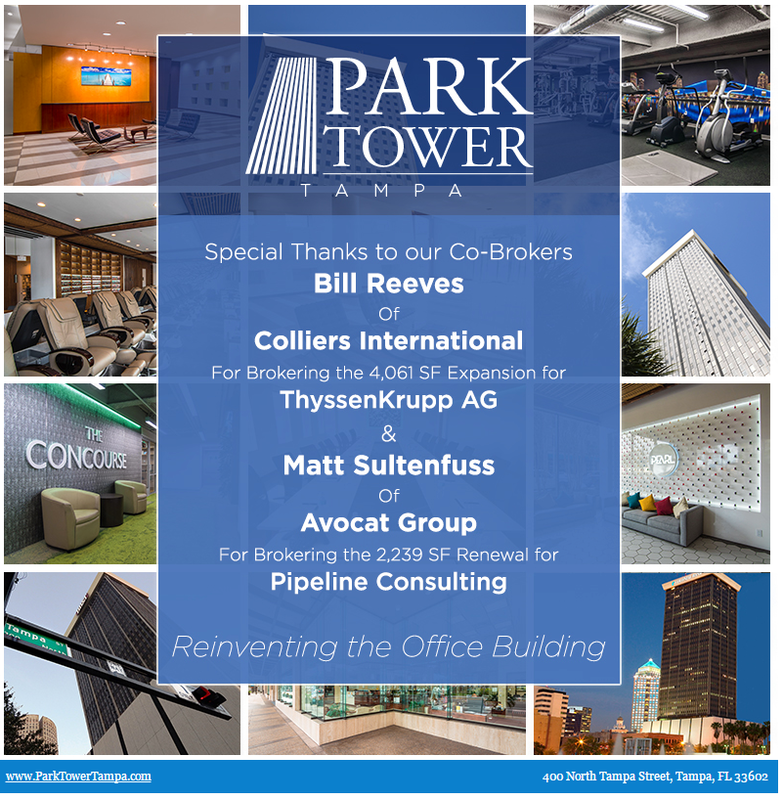 A joint venture consisting of affiliates of NYSE listed City Office REIT (NYSE: CIO), Feldman Equities LLC, and Tower Realty Partners has acquired Park Tower, a 36-story, 475,000 square foot office building located in downtown Tampa. The joint venture purchased the office building for $79.75 million. The joint venture intends to make a substantial investment in the property to modernize the building. The building is approximately 86% leased. Its anchor tenants include BB&T, United States Department of Justice – US Attorney’s Office, Level 3 Communications, and Lykes Insurance. City Office REIT currently owns approximately 1.0 million square feet of office properties in the Tampa Bay market. “We are strong believers in the Tampa Bay market with its tremendous job and population growth and are excited to add Park Tower to our expanding portfolio,” commented Jamie Farrar, CEO of City Office REIT. “As with our other downtown acquisitions, this is yet another opportunity for us to do what we do best – renovating and upgrading office buildings in order to maximize their value,” commented co-owner Larry Feldman, CEO of Feldman Equities. Mike DiBlasi, Feldman Equities Executive Vice President for Leasing and Marketing, will lead leasing efforts. “Located at the corner of Kennedy Blvd. and Tampa St., Park Tower sits on the most important intersection in Tampa. This is a great opportunity for a tenant looking to move into the heart of downtown,” said DiBlasi. Park Tower offers spectacular views of Hillsborough Bay, the Hillsborough River, and the Downtown Tampa skyline. City Office REIT is an internally-managed real estate company focused on acquiring, owning and operating high-quality office properties located in leading markets in the Southern and Western United States. City Office currently owns or has an interest in 4.0 million square feet of office properties. Additional information about City Office is available on the Company’s website at www.cityofficereit.com. The Company has elected to be taxed as a real estate investment trust for U.S. federal income tax purposes. Over the past 30 years, Feldman Equities has developed or acquired over eleven million square feet of office and retail properties with an aggregate value in excess of $3.0 billion. Feldman is a “re-inventor” of the office building and specializes in turning around distressed office assets. Feldman Equities and its partners own and manage 1.6 million square feet of office space in downtown Tampa and downtown St. Petersburg. Tower Realty Partners is a privately held, commercial real estate investment & management company based in Orlando, Florida. Founded in 1987 by principals Cliff Stein & Reid Berman, Tower Realty partners has been involved in the acquisition, leasing, and management of over 20 million square feet of real estate totaling in excess of $1.6 billion in transactions.